On the one hand, shopping is dependable: You can do it alone, if you lose your heart to something that is wrong for you, you can return it; it’s instant gratification and yet something you buy may well last for years. I would not call myself a shopaholic. I wouldn’t even list shopping as one of my top 10 hobbies. I might even say I don’t like shopping. But sometimes, every once in a blue moon I feel like I need something…something material to sooth my soul. I think I might be an interesting case study when it comes to this rare urge I encounter. You see there are just four places I can not resist. The Dollar Store, Goodwill, Ikea and Design Within Reach. Goodwill is a great place for me to go because I LOVE finding something cool for just a few dollars. If I find nothing cool I buy something anyway and tell myself it is cool all the way home. Then I shove it in the yard sale box in the garage when I get there. The Dollar store is even better (Mighty Dollar is my new fav). I mean everything’s a dollar right? How can I go wrong? And Ikea. A prize goes to the woman who can walk through close to 400,000 square feet of super fun, super cheap stuff and not buy a single thing. Even if I made it through the store without buying something (which would never happen) I’d certainly find something in the “as-is” room that I couldn’t live without. Unfortunately Design Within Reach is a different story but oh how it makes my heart sing. I’m pretty sure they don’t carry anything with a price tag under $300 (not so “In Reach”). But…if you go in often enough, as I do, you might stumble across a floor sample or two marked down just enough to make you think it’s a deal. It’s not the kind of showroom that would EVER advertise a discount or a sale but if you’re bold enough to ask they will disclose those coveted floor models that can be carried out the door for the right price. I’m ashamed to admit how many “deals” I’ve gotten there. Take a peak in my garage and you’ll see my acquisitions. Joe says if we ever move he’ll allow me to have a room to showcase my chair collection. That would be fun. So speaking of moving, it’s something we’ve been thinking about for a few years. There are all kinds of reasons to move…and even more to stay put. School is still up in the air. Not sure what will be the best option there. We’d like a little more space down the road but we don’t really need it. We love living on a cul-de-sac and our yard is great. Our house couldn’t be more poorly built or the design more stupid but we’ve done so much to make it reflect us and the things we like. We love the community of which we’re a part and the conveniences to which we have access. Except for Ikea, I can get to all my favorite retail outlets in less than 5 minutes. Seriously, we should not move. But when the moving talk ceased that “need” showed up again and I made the trip to the dollar store where I bought 12 glasses and 6 picture frames, then the trip to Goodwill where I bought 3 pair of jeans for Bradley, then the trip to Ikea where i found a 5 x 7 flokati rug in the “as-is” room for $40 (along with 20 other things). And then came the trip to DWR. There weren’t as many samples available this visit but something did catch my eye. It was a Primary Pouf in Berry. At first glance you’ll wonder whether its soft or hard, foam or concrete, heavy or light. It’s one of those things that I knew was meant for me that no one else would understand. The foam cushion is soft when you park it though firm enough to leave your drink on top of it. 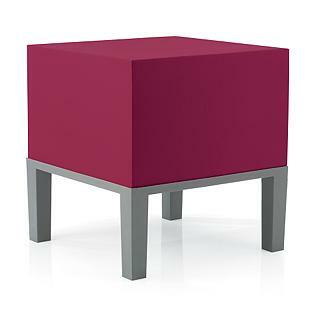 Though its concrete-like appearance makes it look heavy, the Pouf is quite light so you can move it around easily. The boys love it because it’s so light and of course anything they can move is perfect for building forts. Now I’m just hoping they won’t take a bite out of it. So I get this thing home and I love it but it really needs a companion. That said, I have spent the last two days searching for one on eBay, Craigslist, everywhere I can think to look…I just don’t want to pay full price for the mate. After getting weary with the search I begin to find my way out of the fog and I laugh at the fact that I am trying to satisfy my longing for heaven with a big pink foam cube and as squishy as it might be it won’t fit. I really do love it and it makes me happy when I look at it so I’m keeping it. However, from here on out it will serve as a reminder that while I’m living here, I’m not meant for here. See why it needs a friend? They look better in multiples. I am dying to tryout the pouf! And love how you’ve found a meaningful purpose for it – reminding you of your true home. I love this post and the pouf.